Welcome to the Santiago: A Myth of the Far Future, a multi-part Pathfinder adventure path set in a future western-style sci-fi universe. In this campaign, the heroes take on the role of bounty hunters in a search for a legendary bandit. They will travel to different worlds, battle outlaws, face off with rival bounty hunters, and encounter alien species. The heroes will also need to forge alliances, however shaky, and gather what information they can in order to succeed. Consider this guide a gamemaster’s overview of the adventure path. 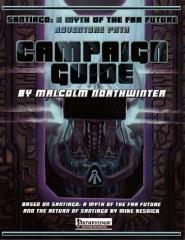 It contains an overview of the entire campaign, setting material, monsters (aliens), and more.